If you cook a lot at home, then I’m sure you are very well-aware how tedious it can be to chop and slice vegetables. Chopping up one vegetable alone can take you up to 3 minutes, what more if you need to prepare a large vegetable dish for a large gathering? It’s a good thing you can always rely on vegetable choppers to get the job done for you. To chop all kinds of vegetables with ease, you will need to have trusty vegetable choppers in your kitchen. Let me help you get the best vegetable chopper for your home. Read on to find suggestions on which vegetable choppers to get for your kitchen. So, what exactly are the benefits that would make you want to buy a vegetable chopper? Well, there are really just 3 major advantages to using a vegetable chopper and that’s speed, efficiency, and cleanliness. The first two benefits are related. Since the vegetable chopper makes the whole chopping process efficient, no time is wasted, therefore better speed when it comes to chopping vegetables. You see, with a nice vegetable chopper at your disposal, you will not be required to go through each vegetable slice by slice. All you really have to do is peel the vegetable, place it inside the chopper, and let the machine do most of the work for you. As for the third major benefit, vegetable choppers usually make the chopped ingredients well-contained, therefore making the whole process less messy than when you’re just chopping the ingredients on a chopping board. In fact, some vegetable choppers even come built-in with bowls for easier transferring. Needless to say, a good vegetable chopper can reduce your chopping time in half if used properly. There are certain features that you will have to look out for when it comes to choosing the best vegetable chopper for your home. To make sure that you don’t end up being an unhappy and unsatisfied customer, try to use this list of important factors as a guide while you choose a vegetable chopper. Vegetable choppers come in different sizes. Some vegetable choppers are handheld and are very compact. Others are larger but would require a larger counter space. Whatever you decide to get, just make sure that it will fit your available counter space and storage space. To get a vegetable chopper that you can truly enjoy using, try to choose one with a highly ergonomic design. This may mean going with a vegetable chopper with comfortable handles, a stable base, or an easy-to-use chopping mechanism. Try to choose a vegetable chopper that is made with durable cutting materials. Most vegetable choppers today are made with hard plastic and stainless steel materials. For seamless cutting, I recommend you go with a vegetable chopper that comes with a metal cutter. Even though plastic cutters can be somewhat effective, it couldn’t possibly beat the effectivity of metal ones. Some vegetable choppers can only chop one vegetable at a time, while others can chop multiple vegetables all at once. Try to go with a vegetable chopper that will allow you to chop the amount that you require. The last thing you should never forget are the factors that add to the overall usability of the tool. When it comes to vegetable choppers, I suggest you look for one that comes with its own bowl, interchangeable cutters, etc. for added versatility. One of the simplest vegetable choppers in the market today is this Vidalia chop wizard. Right out of the box you will be able to use this vegetable chopper on all sorts of vegetables with ease. 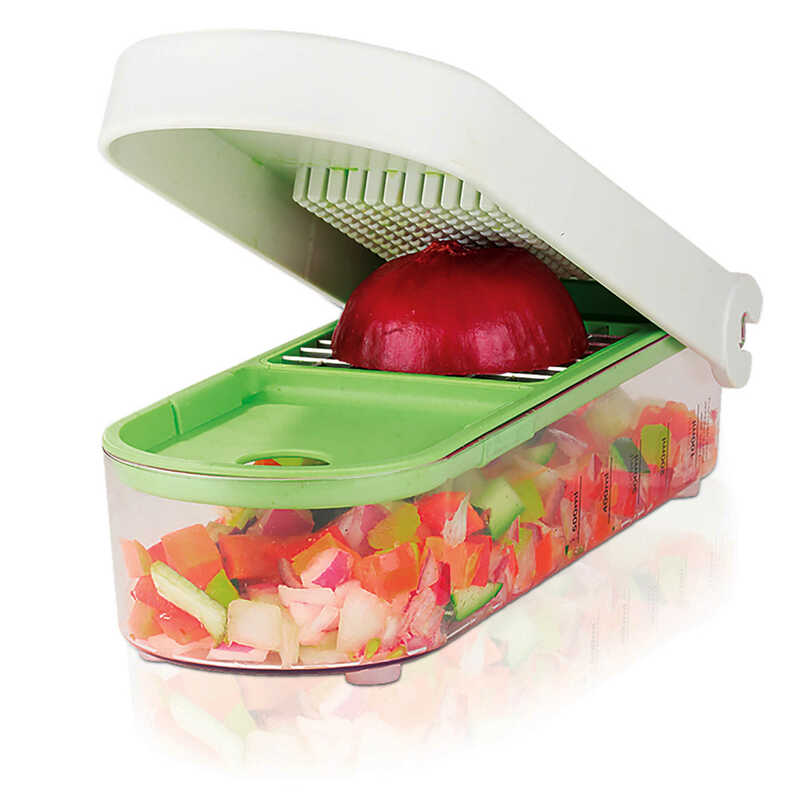 What’s great about this vegetable chopper is that you can use it for boiled eggs, cheese, and all sorts of vegetables. To use it, all you really have to do is peel or slice the vegetable in half, place it inside the chopper, and give it a nice press to chop the food. What I like about this product is that it comes with its own container. The container makes it easier to clean up after preparation. The container also makes it easier to transfer the ingredients into a pan, pot, or plate. Another great thing about this vegetable chopper is that it comes with two interchangeable sharp cutters that will allow you to perfectly chop all kind of vegetables, even hard ones, every single time. Needless to say, this vegetable chopper is a practical choice that will help you get the job done without any fuss. This can be relied on not just for cutting vegetables but also for boneless meats and nuts. Herbs can also be chopped with this nifty tool. If you need something powerful enough to cut through ice, you can get this one as well. Since it is hand-operated, there is no need to plug it in an electrical outlet to work. This is a perfect choice when going out camping or when you need to prepare food in your mobile car. The mechanism is also simple and straightforward. Just place the vegetables you want to cut in the container, lock the lid in place and pull the cord. It will chop ingredients evenly even when you are putting in multiple ingredients at once. This has a large capacity that will allow you to put all the things you need to chop inside and just pull the string to allow it to work its magic. It is powerful enough to chop tougher vegetables and even meats, nuts and ice. All the ingredients are contained in one place, so you won’t deal with a lot of mess. The parts can be disassembled and cleaned in the dishwasher. Just make sure you place it on the top rack. It’s very simple to store since there are no cords and no loose parts. It is made from thick plastic material. Some said it isn’t particularly effective in chopping leafy greens. If you are looking for a tool that’s more than just a vegetable chopper, then this one might be the best choice for you. The Fullstar vegetable chopper is practically an 8-in-1 kitchen tool that will allow you to create different kinds of slices for all kinds of ingredients. With this vegetable chopper at your disposal, you will be able to julienne, ribbon, grate, dice, and chop different ingredients like eggs, nuts, vegetables, fruits, cooked chicken, and even chocolates. What I like about this tool is that it reduces the mess during chopping because it comes with its own 1-quart container tray that makes the whole process more organized. Plus, the container makes it very easy to transfer the chopper to other containers. Another great thing about this vegetable chopper is that it’s completely safe to use on food. It is made with BPA-free materials that will ensure your health. You don’t even have to worry about chopping piping hot ingredients with it. If you decide to get this vegetable chopper, you will get multiple slicers including a coarse grater, fine grater, julienne slicer, mandolin slicer, long cutter, straight ribbon blade, and a dicer. The whole thing is even backed up by a 100% money back guarantee. 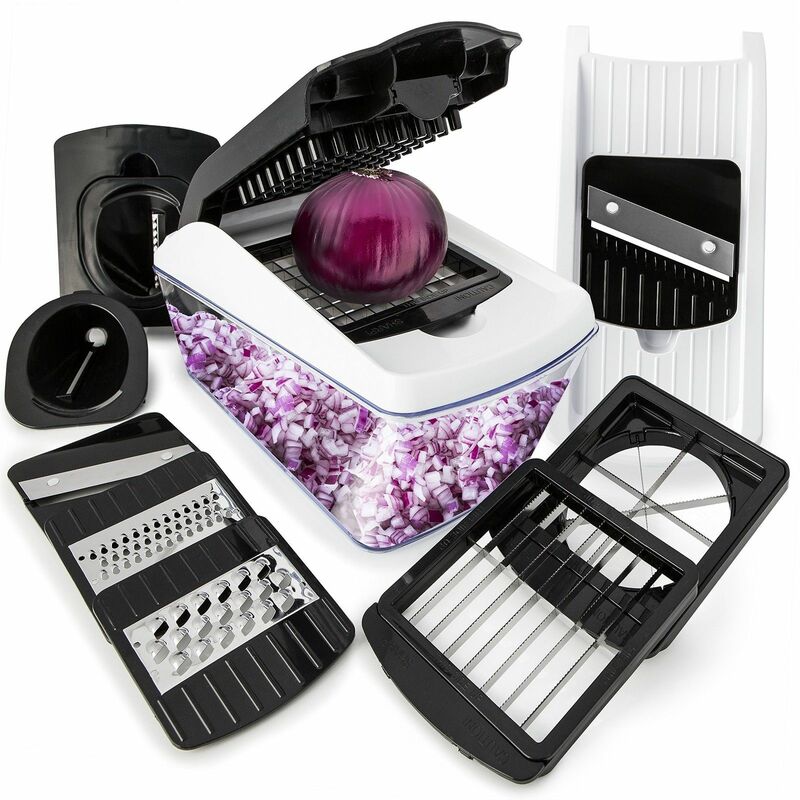 You can produce different cuts and slices, great for an assortment of vegetables. If you don’t really care much about capacity and compact designs are important to you, then this vegetable chopper might be the perfect one for you. This vegetable chopper comes with a completely handheld design that makes it very compact. 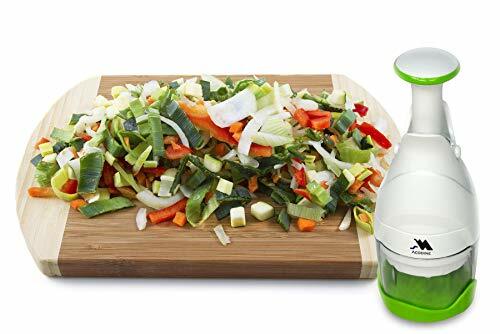 What’s great about this vegetable chopper is that it doesn’t require any counter space, you don’t need much storage space, and you can easily bring it anywhere with you if you plan to create perfectly chopped vegetables while you’re on the go. But what I loved about this vegetable chopper is how you can use it directly over a plate, bowl, pot, or pan. Since it is completely hand held, you can chop your vegetables with it right into your preferred container. Another thing I liked about this vegetable chopper is that it allows for seamless and less messy cleanups. Perhaps the only downside to this vegetable chopper is that it isn’t the ideal choice for chopping large cuts of vegetables. Since it is completely compact, it’s also not the best choice for chopping multiple ingredients since it can be tiresome. However, even though it is a small and compact tool, it’s still a great vegetable chopper that offers practicality and ease of use. If you wish to cut the amount of time you spend on chopping vegetables and the effort it takes to clean up after chopping, then this simple press down vegetable chopper might be the best choice for you. What’s great about the Acodine vegetable chopper is that it ultimately helps you save a lot of time during food preparation because it does pretty much all of the work for you. Right out of the box this vegetable chopper will allow you to create perfectly-chopped ingredients with just a couple presses on its chopping mechanism. Another thing I liked about this vegetable chopper is that it comes with its own container that helps lessen the time for clean ups as well. This product is also very easy to clean and maintain. It comes with easily removable parts that will allow you to reach all its nooks and crannies during cleaning. However, the parts are not dishwasher safe and needs to be hand washed to avoid damage. Lastly, this vegetable chopper is fully supported by a replacement warranty. If you ever encounter any technical issues or if your product is faulty or damaged, Acodine will replace the whole thing with a new model. Which of these products should you choose for your vegetable cutting needs? We recommend the Vidalia Chop Wizard if you are looking for an uncomplicated set-up. It is a no-brainer to use and has cutting tools that will work for different kinds of vegetables. It also keeps the vegetables you cut contained so you don’t have to worry about the mess. 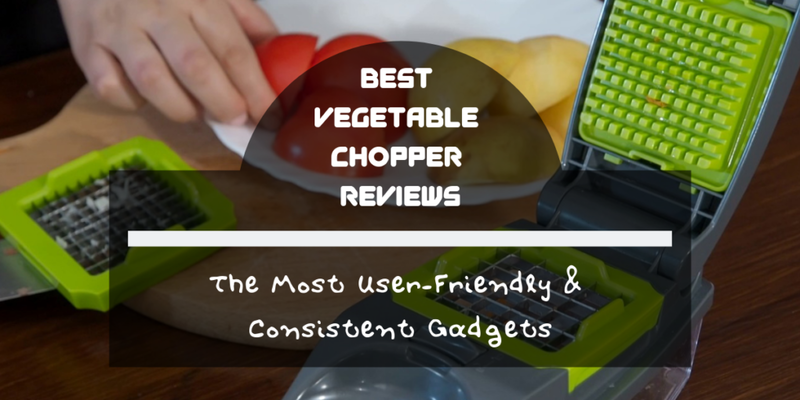 If you are looking for something that can cut tougher vegetables, the Chef’n VeggiChop Hand-Powered Food Chopper might be a better choice for you. It offers flexibility because you can use it to chop meats as well. The Fullstar Vegetable Chopper is the best when it comes to versatility because it can help you achieve different types of cuts and slices. Whether you want to julienne leafy greens or make a zucchini noodles, this is a good choice for you. 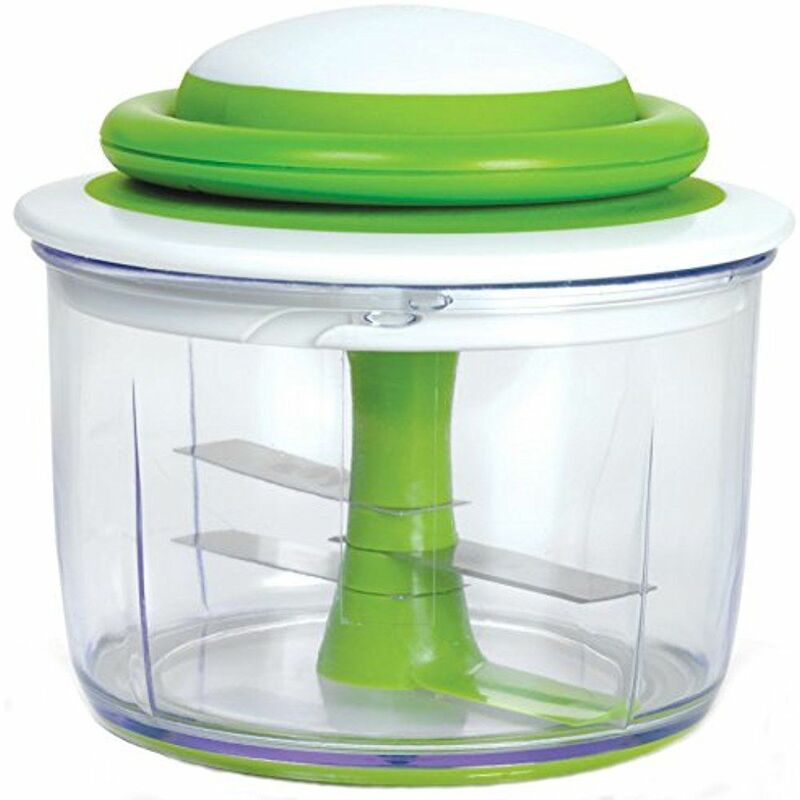 If you have a small kitchen and you don’t like big and clunky kitchen tools, the Vremi Food Chopper is a more ideal choice. It has a small footprint that won’t take up a lot of space. The Acodine Manual Hand Chopper has been getting rave reviews because of its efficiency in chopping an assortment of vegetables. Get this if you want something that is simple to use but still gets the job done. Make sure you click the links of the products that suit your preferences and needs. Also check out our homepage to find out more kitchen tools that can make cooking and preparing food a lot easier.